And so it must be summer as dozens of youths are clashing with French police, throwing rocks and burning cars in the western city of Nantes after police officers shot dead a 22-year-old driver who had been stopped for traffic offenses and was apparently wanted for arrest for earlier crimes. In the first few hours, the details of the incident remained unclear and messages on Whatsapp and Facebook stated that the police had willingly shot the young boy after which many of his ‘friends’ rushed to fight the local security forces. In Breil, a district of housing estates that mostly has immigrant populations, multiple cars were being torched and a shopping center was set alight. 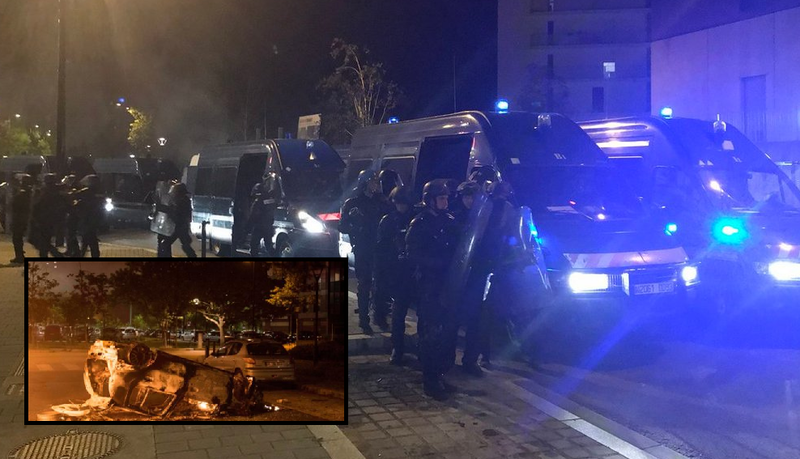 The mayor of Nantes decided to send in some 200 riot police to quell the unrest but then saw it spread to other areas of the city as well as rampage was later reported in the neighboring Malakoff and Dervallières districts. "The priority today is to listen to the inhabitants. We are standing shoulder to shoulder beside them," said the socialist mayor of Nantes Ms. Johanna Rolland on her arrival in the neighborhood where the young man died. "My first thoughts go to this young man to his family, to the inhabitants of this district. I call for total transparency about what happened." By this morning, local newspapers were able to report that the youth was wanted for arrest by the attorney general of Nantes and that he had apparently resisted after which a fight broke out. France and all of Europe deserve it for importing millions of SAVAGES into their nice, clean, safe white countries. What we are witnessing is the transformation of France going from a country steeped with French culture to a third world shithole just like the places the mudslimes supposedly sought asylum from.